It was just turning 8:30 pm. As usual, Ralph was already in bed with the lights out. He goes to bed by eight most nights and will sleep past eight in the morning if I let him. He is genuinely tired, but I also suspect that he doesn’t know how else to fill the time. Neither books nor television hold his interest for very long. Neither does music or the kind lengthy conversation he used to be famous for. I was in another room half reading the newspaper, flipping TV channels, thinking a little guiltily about a recent comment from Going Gently into That Good Night about the way those with dementia suffer. Mostly, though. I was feeling sorry for myself over having another long night alone—no need to remember that in my thirties and forties, a night to myself without family would have seemed a gift; that’s another story. Suddenly I stopped clicking. Because there on some random cable channel was The Larry David Show. 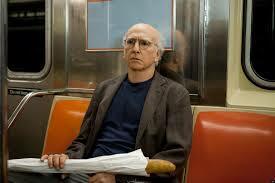 Actually an hour and half of Larry David episodes was listed on the schedule. I rushed into the bedroom and turned on our set in front of our bed. “I am nothing like Larry David,” Ralph said when I reminded him how the kids used to tease him that he was Larry’s spiritual twin, (Of course they teased me that I was the spiritual twin of George’s mother on Seinfeld) but soon he was sucked in. Ralph began to chuckle. I began to chuckle. Sometimes I had to explain a character who had been introduced earlier, but Ralph had no trouble following the complexity of the wit. We laughed out loud at the same jokes. The three episodes flew by. It was ten o’clock and Larry was over. Some lame movie started, but I wasn’t ready to go to sleep. Miraculously, neither was Ralph. I switched channels. Another miracle: there was Seinfeld. And one of the classic episodes. 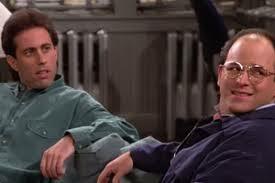 Jerry’s car is stolen by his mechanic; Newman and Kramer try to make their fortune with a mail truck full of recyclables; and George, after being sent briefly to a mental hospital, can’t get a tune from Les Miz out of his head. “This was fun, wasn’t it,” I asked and Ralph agreed. As he rolled over to sleep, I turned off the television plotting what other comedies we might watch. Then I tried to sleep, but George’s damn song was in my head. “Master of the house,” I sang softly. Ralph hooted. I repeated the line. Soon we were whooping it up like five-year-olds. God it felt nice. I honestly cannot remember when we last shared such a genuinely good time. No soft-pedaling or covering for memory lapses, no manipulating behavior, no compromising my needs for his, no resenting the limitations of our life. Just Ralph and me laughing away on the same joyful wavelength. Thanks and hugs back. It’s ironic isn’t it? In the childrearing years, all I wanted was an evening to myself (forget mornings, which seemed an impossibility). Now I have too many, but I am pretty sure I’ll come to the place you describe. Lovely. Definitely one to keep in your memory bank. Thanks Mary. I wish there were a bank where we could deposit those good memories for safekeeping so they don’t get lost in the onslaught…. Oh, I think the good memories embed themselves somehow and pop out when we need them. I am! Your post reminded me of the enjoyment dad and I shared watching a UK comedy programme called Only Fools and Horses. It was on one of the channels which show repeats and was found by accident (like you and Larry David). I’d not been paying much attention until I heard dad chuckling and suddenly we were watching and enjoying a programme together. There was a talent show programme on one evening which I wouldn’t have been watching usually but I suddenly realised dad was gripped by it. As this was very late on his dementia I was pretty sure he hadn’t much idea of what was going on but started watching and realised he was totally swept up by the emotions of the bands who were being either selected or sent home. Even if he didn’t fully understand what was happening he got the emotions of those young people – totally elated if they got through, sighing sadly if they were rejected. Sorry, didn’t mean to ramble on so much but lots of happy/sad/sweet memories have been triggered tonight. Am glad that that you shared this. It feels good knowing something I wrote connected you back to your own moment of sharing with your dad.